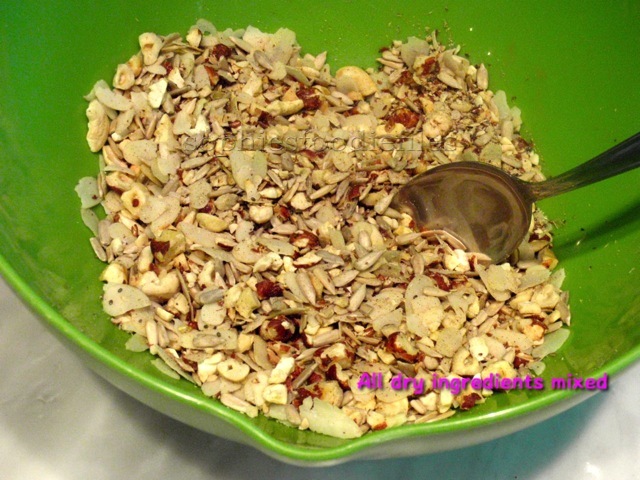 Vegan Gluten-free Nut & seed granola! I wanted to use different types of nuts & textures. I happen to have lots of sunflower seeds which I absolutely love. So, I used 3 types of nuts & 3 types of seeds. Let’s see this beautiful tasty granola in a lovely bowl? Preheat your oven to 180°C for 10 minutes. I always use a fan oven. Otherwise, adjust your oven to the right temperature. Take a large roasting tin & smear in with vegan butter & up the sides a bit too. Push your baking paper well into it. Take your food processor & place S-blade in. Add hazelnuts & cashews. Place lid on & pulse until crumbled up. Take a big bowl & add all of the dry ingredients. 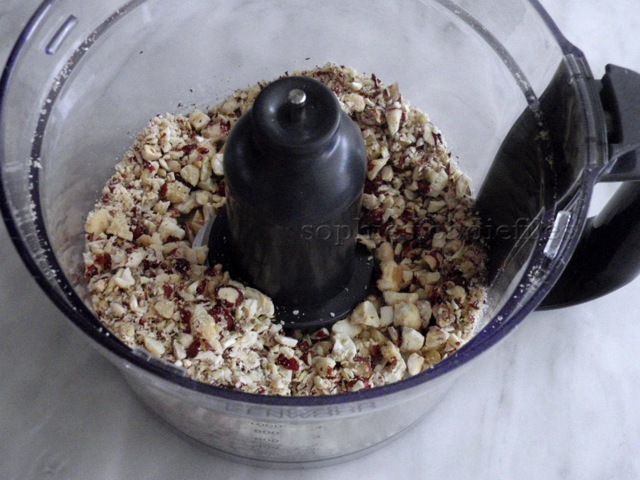 So, add sunflower seeds, broken flaxseed, chia seeds, cinnamon, white almond flakes, chopped hazelnuts & chopped cashews. Mix well with a spoon. 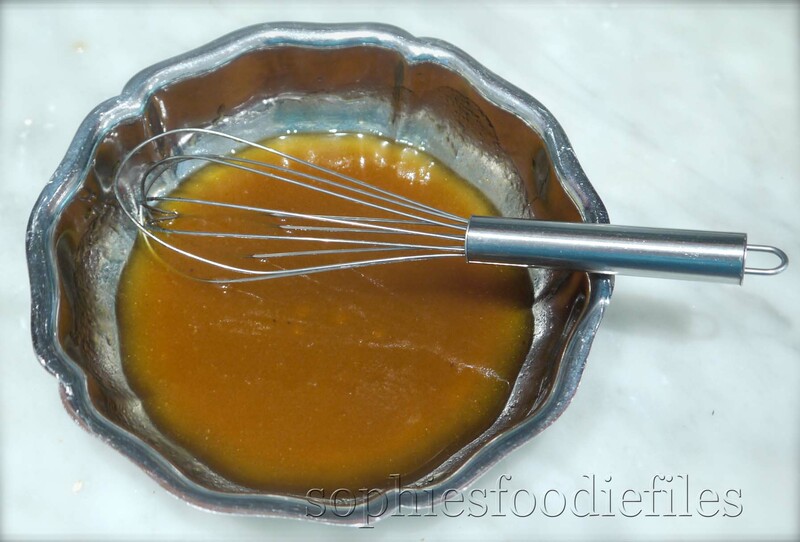 Add wet ingredient, aka maple syrup to the bowl of dry ingredients & mix well with a spoon. See that every ingredient has been coated with the maple syrup. 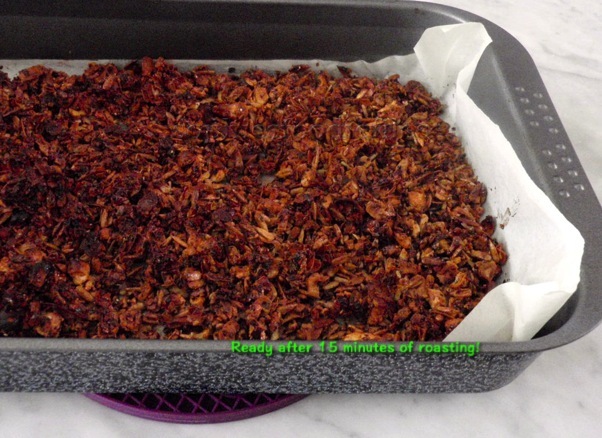 Spread the granola mix all over the base of the roasting pan, on top of the baking paper so that all is evenly divided into 1 layer. Vegan Gluten-free nutty quinoa granola! No-oil Granola! Vegan & Gluten-free! Home-made nutty quinoa oat granola! Vegan & Gluten-free! This morning, I invented this delicious tasty nutty quinoa-oat granola, all home-made of course! 🙂 This is also Vegan & Gluten-free too! I added lots of good stuff to it, just wait & see! I love it with cold soy milk, straight from the fridge. Yum yum yum! 1. Preheat your oven to 180°C (350 F ) for 10 minutes. 2. Take a chopping board & a big knife. Chop your hazelnuts into smaller pieces. Take a large bowl & add all the dry ingredients, so add oat flakes, white quinoa, red quinoa, chopped hazelnuts, almond flakes, sunflower seeds, broken flaxseed, chia seeds & cinnamon. Do not add more cinnamon!!! You want a hint of it not full on cinnamon, otherwise it is too overpowering! Mix well with a larger spoon. 3. Add wet ingredient aka maple syrup grade C to the bowl of dry combined ingredients. Mix well with a spoon. Take a larger non-stick oven pan & dot with vegan butter, on the bottom & on all the sides. Press your baking paper in it. Divide your granola all in 1 layer in it. Spread it all evenly out. Roast into the hot oven for about 13-15 ,minutes. After each 5 minutes, take the tray out of the oven & stir everything round into the pan for an equal bake & to prevent burning. Do this again after 10 minutes. Watch your granola carefully! You don’t want it to burn! My granola was ready after 13 minutes. Your house will smell amazing & your granola will be golden brown! 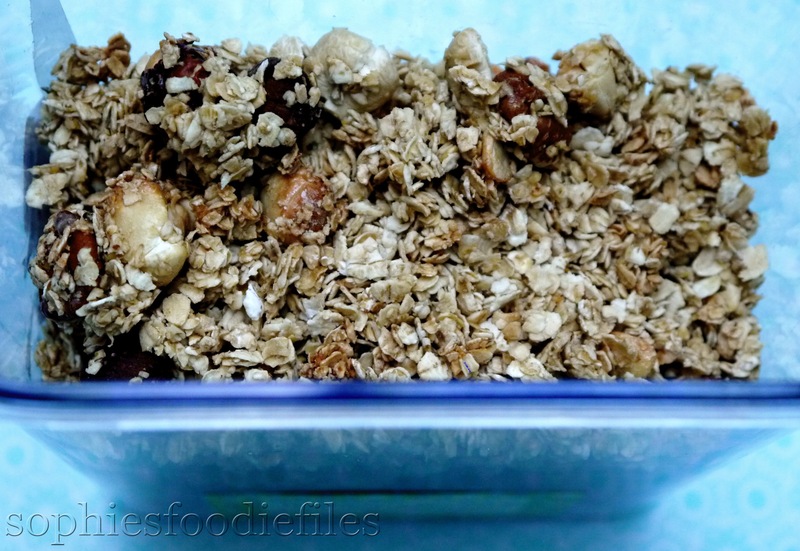 Make this No-Oil tasty Granola right now! How? 2. I loved it with cold straight from the fridge, home-made cashew milk, of course! 1. No-oil granola, take 2: Home-made Vegan Gluten-Free Nutty Quinoa Oat granola! Stay tuned, Subscribe through the link below to get my new cool newsletters aka posts! Join 1,800 email Subscribers! It is free! Click onto this link below! 1. 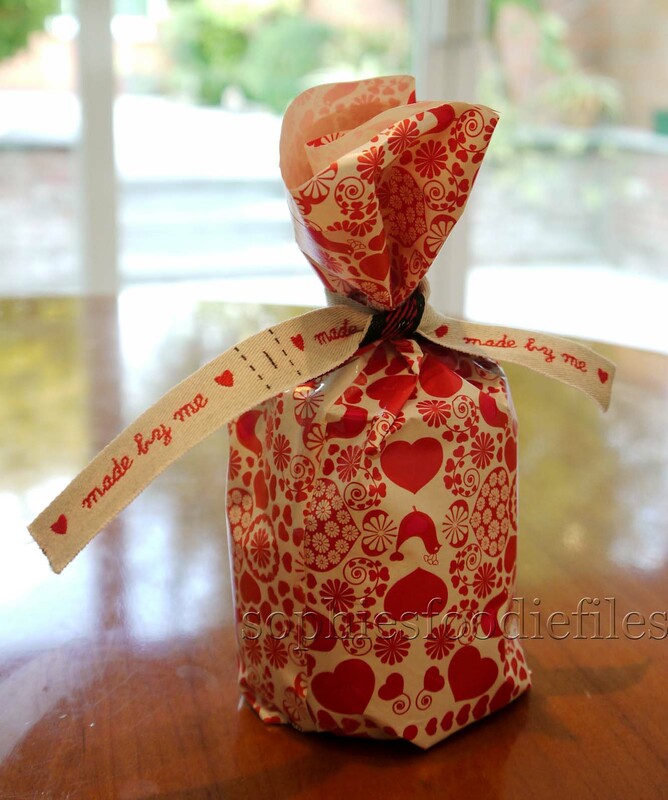 Vegan gluten-free granola, a tasty food gift! 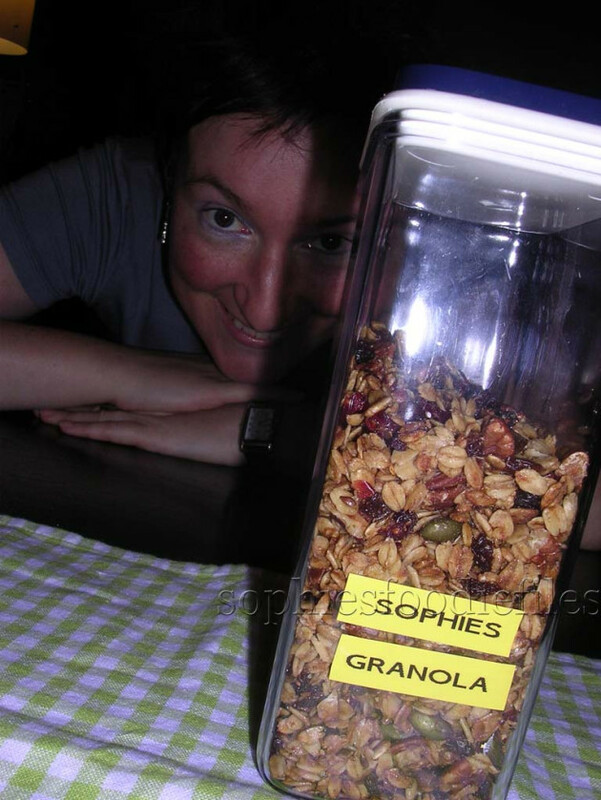 Sophie’s Vegan & Gluten-Free granola! A tasty Food gift! 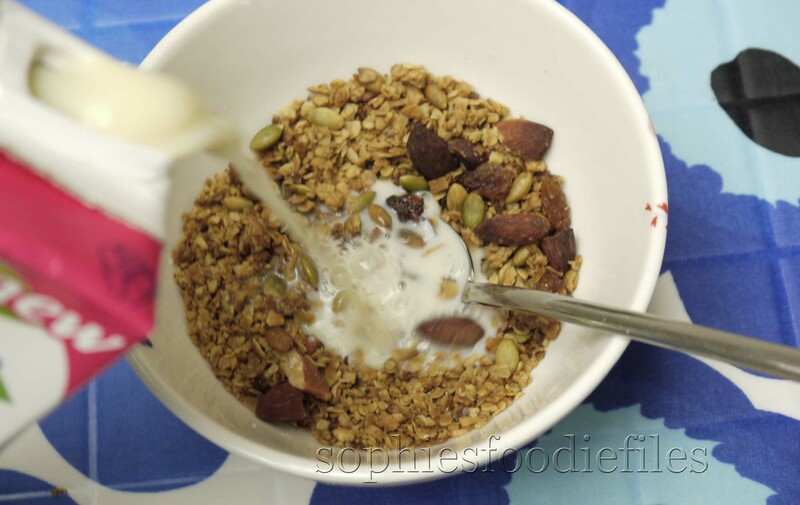 Sophie’s Vegan + Gluten-free granola! 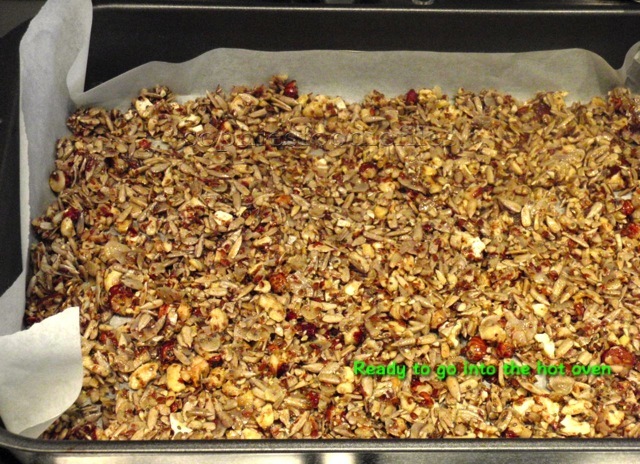 This morning, I made this tasty & easy to make Vegan & Gluten-Free granola! 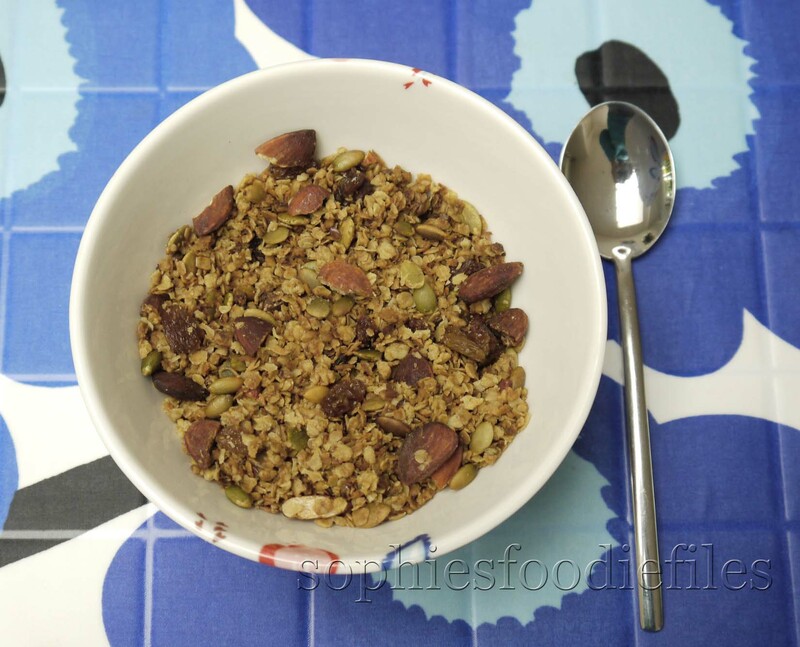 I love eating granola when it is getting colder outside,…outside, it is raining I am inside in my pyjamas, sipping from a lovely cranberry tea & making this tasty granola! 😉 It is all about being comfortable! 😉 I was listening to some good old music from Will Smith & Janet Jackson! How did I made it? Read on! 230 gr medium-sized Gluten-free oat flakes/ Use gluten-full medium oat flakes when not being gluten-free! The wet ingredients fully joined! The granola before being roasted! 3. Place into the hot oven & roast for about 20 minutes until browned on all sides. After each 5 minutes, turn the granola over in the pan, for an equal roast on all sides & to prevent burning!! Place everything back into 1 layer into the pan. After being more roasted, your house will smell amazing & your granola will get darker each time. Check often! 🙂 When ready, take the pan out of the oven & place on the kitchen counter to cool off. When cold, add the raisins & mix well. Enjoy instantly with your favourite plant-based milk! I suggest my home-made almond milk or vanilla almond milk here! MMM! 2. 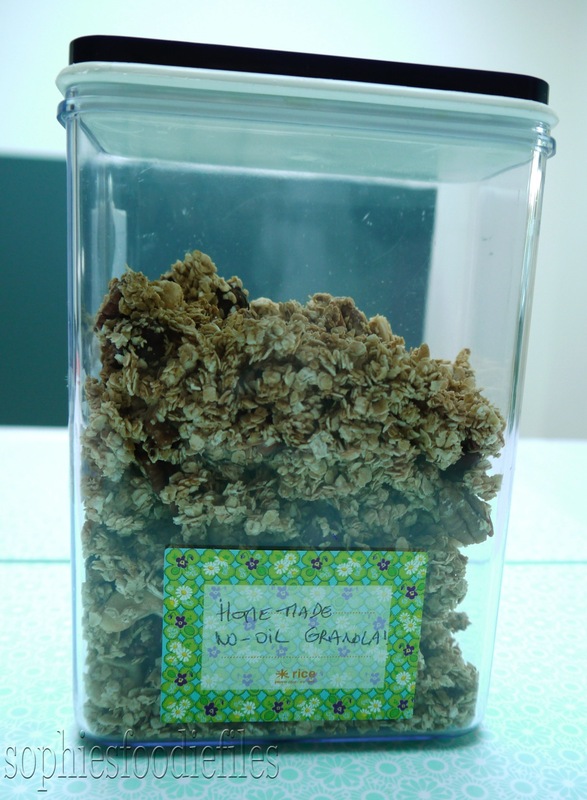 No-Oil Granola, take 1! 3. No-oil granola, take 2! Nutty Quinoa oat granola! 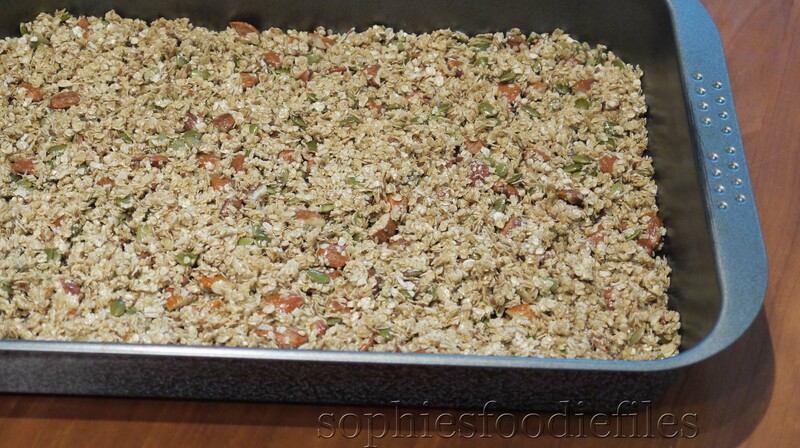 Sophie’s Gluten-Free & Vegan Christmas granola! I adore making granola. 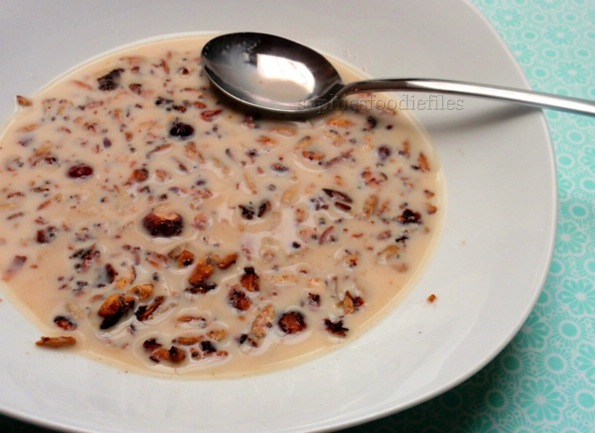 You can find a lot of unhealthy granola recipes on the internet. I experimented with other recipes & I came up with this one. This is my favorite granola recipe. My husband & my family loves it! I call this one a Christmas recipe, because there are red dried cranberries & green pumpkin seeds in it. They are the primal colours of Christmas. It is lovely enjoyed with some vegan coconut yoghurt or soy yoghurt or a vegan nut milk. You must have seen this picture before, I use it in my about page. This picture is already 4 years old. So, is that one, below. MMM! This would make an ideal Christmas gift!!! Yum yum Yum,…Let’s see How I made it! 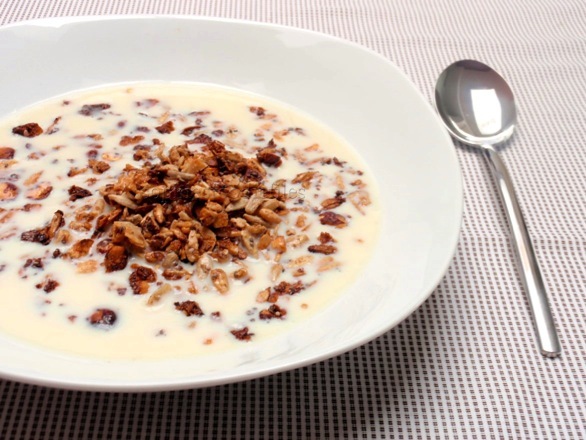 Recipe: For a whole lot of granola! 2. Take a large bowl & put the GF oat flakes, pecans & pumpkin seeds in it. Mix well. Add 1 tablespoon of flaxseed to it. Mix well. 3. In another bowl, mix canola oil with the maple syrup. Add vanilla extract. Stir good. 4. Put the ingredients of bowl 1 into bowl 2 & mix well. 5. Take a non-stick roasting tin & spread out evenly in to the roasting tin. 6. Bake for about 18 to 20 minutes until all crisp. 7. Every 5 minutes or so, you have to stir everything around, so that it will be crisp on every side. Otherwise, it will burn on one side & it wouldn’t be crisp on the other side. 8.Bake until everything is golden & ready. 9. When it is ready, turn the oven off. Take out of the oven & let it cool off completely. 10. When it is all cooled of, place it in a bowl & add the dried fruit. You can choose whatever fruit you want, but I like this combination. 11. 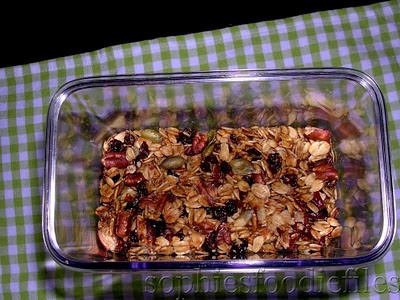 So, I added the dried cranberries & dried raisins & mixed it with a spoon through the granola.